Cargnello Anna, Italy - bpw-leadershiplifelonglearnings Webseite! 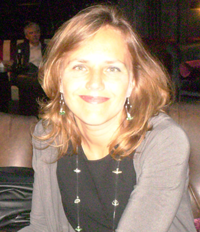 Anna is the Coordinator of Goethe-Zentrum Triest (Partner of Goethe-Institut). She is responsible for the coordination of all the activities of the Association, for marketing and internal and external communication and she runs several projects in collaboration with public schools. Beside she is consultant and trainer for marketing, time management and communication. She is professional coach for private and business clients. Her clients are small and medium-sized companies and the Chamber of Industry and Commerce of Trieste. Anna is a past vice president and currently secretary of the Club Tergeste in Trieste. She is a certified PEP Trainer and runs PEP Trainings in Italy.